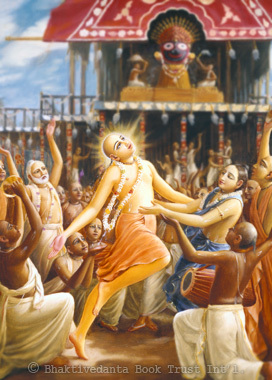 Sri Chaitanya taught that Bhakti, or loving devotion to Krishna, is both the most effective spiritual practice and the ultimate goal of all spiritual practices. Because He is Krishna Himself, His teachings are identical with those of Krishna in Bhagavad-gita. His only written work is His Shikshastaka, or “Eight Instructions,” a concise course in attaining spiritual perfection. Sri Chaitanya also contributed immensely to theology by teaching that God is simultaneously identical to and different from His energies, including the material world and us finite souls. Among the many books by His disciples, Krishnadasa Kaviraja’s biography Chaitanya Charitamrita is both a fascinating telling of Sri Chaitanya’s life and a rich blend of deep devotion and robust theology.